Belay that Amazon gadget order. Fermented foods made with various strains of microbes may become a staple of the Undoctored and Wheat Belly programs. These foods are unlikely to be offered in the retail market for some time, so we need to be able to make them at home. Further, the specific requirements of the particular species and strains vary, and cannot be presumed to be fully compatible with, say, typical retail yogurt appliances (due to possibly novel optimal temperatures required). Sous vide devices may provide more flexibility, but that’s still more expense than is really necessary. These machines are often extremely disappointing. They only have one job, and outside of conventional yogurt using conventional cultures, they do it poorly. Configuring some thermal confinement, water bath, a fermentation container, and a source of low heat is often pretty easy, but it is necessary to know the temperature range desired. For the test batch used in developing the reactor described here, I was shooting for 97°F. We also have a programmable pot, but its undocumented, non-adjustable yogurt cycle was found to run between 105-115°F. The rig at right worked on the first try, and was composed entirely of material found around the home. You do not need to buy a $900 Igloo and thermostatically-controlled warming plate. If you are going to invest in anything, get a digital probe thermometer with a generous lead length. Some sort of insulated box is needed, ideally one that is low fire risk. Depicted is a 52 quart insulated polyethylene camp cooler, but a Banker’s Box nestled in bubble wrap might do. The idea is to have a very low/slow heat exchange with the room environment, which does also imply low/no air leakage. We make ½ gallon at a time, in stainless steel pot, with a heavy (probably aluminum core) base, and do not use a water bath as shown. For small batches, or containers having negligible thermal mass (such as Ball® jars), some additional thermal mass may be needed (beyond just the fermenting mix). This provides a thermal flywheel effect, tending to average-out any temperature swings, and also isolating the batch from direct radiation from the heat source. Pick a water-tight container that fits in the housing without touching the top or sides. Place some sort of stand-off device(s) below the batch container or bath, such as a trivet. Inverted sake cups were used here. This decouples the batch from the container floor, and room floor below it, and provides complete internal air circulation around the bath. Decide how much yogurt you want to make at once. More than 2 quarts/liter might present some challenges in scaling the bath and housing. For the test batch, a 1 quart Ball® jar was used, (lid loose) in a 2 quart sauce pan. This bath container does not really need to be metal. Plastic, ceramic or glass is fine, as the temperature is not very high (unless you plan to use it also for running a pasteurization cycle on the stovetop). Surprisingly little heat is needed for yogurt. Depicted here is an old plastic shop light, with a retired 14W compact fluorescent bulb (CFL). That’s 14W consumed. The amount of light (Watt-equivalent lumens) is irrelevant. The light and the waste heat all end up as heat. DO NOT let a bare bulb contact the insulated housing. Even CFL and LED bulbs get too hot. I had to test several old bulbs (starting with a 40W incandescent) before finding one that hit and held temperature. A 13W was not quite enough — however, using a heat source that is not quite enough may be OK. Just plan to drape a towel or blanket over the closed housing. This provides as much as 10° more heat rise, adjustable by layering. If you use an incandescent bulb, or dimmable CFL/LED, you could use an external in-line dimmer to control power level. It wasn’t necessary for my setup. A generic digital probe thermometer was used here. It needs to be something that’s reasonably accurate in the 90-120°F (32-49°C) range. You can use a wireless household indoor-outdoor set, but won’t be able to probe the water bath directly (and can’t use a metal housing for anything wireless). If the digital thermometer has an alert function, determine what temperature to have have generate an alarm. For production batches, an alert at 105°F (41°C) or 110°F (43°C) is useful. You can also use a mechanical (candy) thermometer, but you’ll need to open the housing periodically to check, which usually results in a temporary loss of a degree or two. Monitor the setup continuously while dialing-in the the heat source. If the heat source is too great for the application, a thermal run-away presents a real risk of fire. Close the lid. Do some trial runs with just the heat source in the housing. Don’t bother with a simulated payload until the inside air temp alone is roughly dialed-in. Fill the fermenting jar(s) with plain water, at the target temp. Place the jar(s) in the bath container and add water, again to target temp. Place this pre-warmed test load in the insulated housing, close lid, and turn it on. Monitor the temperature for many hours, ideally overnight, particularly if the whole rig is in some part of the home subject to temperature swings. Developing your scheme on the basement floor might be ideal, or a closed closet floor if you have no basement. 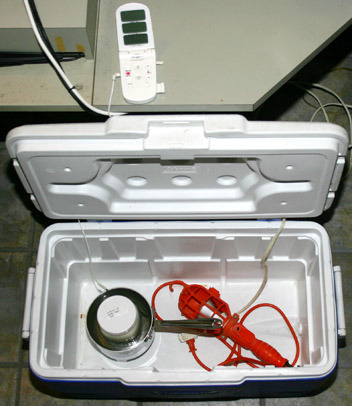 For the rig depicted, I found that it natively wanted to be at 98°F, -1°F, +2°F, as measured at the bath water. Perfect for the test batch. Yes, you will need a timer. Your cell phone or an alarm clock suffices. Yogurt recipes and instruction steps are not part of this article, as they are independent of the equipment used. If you have a range with a warming drawer, and the drawer is deep enough for fermentation containers, run it for an extended period with water-only, and, for (if any) settings, characterize the average temperature, and variation range. Ours turned out to run too hot at its lowest setting, yet did not generate enough waste heat to warm the oven bay above it. Even if this gambit works, you could be tying up your range for 36 hours at a time, many times per month.